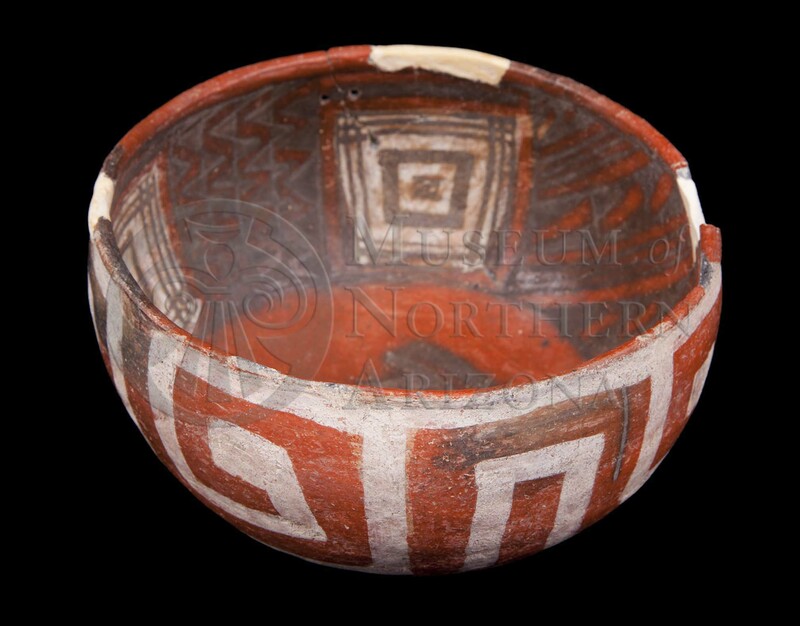 Showlow Polychrome bowl from the Museum of Northern Arizona collections. Click the image to open the Showlow Polychrome gallery. Showlow Polychrome is a White Mountain Red Ware type with the highest concentration below the Mogollon Rim between Cherry Creek and the White River. Core Color: Gray, sometimes slightly pink. Temper: Small angular fragments (sherds) nearly uniform in size, grayish in reduced, yellowish or tan in oxidized portions; occasionally red or black fragments; grains of quartz sand fairly frequent; temper inconspicuous in cross-section when core is light colored, but conspicuous when core is dark; occasionally conspicuous on worn surfaces. Surface Finish: Bowl interiors bear either an overall white slip or a part red and part white slip. Bowl exteriors are slipped red; jars have white slip on the neck, shoulders, and part of the body, and red slip on the base and part way up the sides. Surfaces are well-smoothed, but not overly polished. Surface Color: Red to orange-yellow or gray to white, depending on slip; core and surface color generally contrast. 3.9 mm to 6.9 mm; average 5 mm. Paint: Black and white; black generally lustrous, often in relief; glaze paint sometimes runny; black paint sometimes brownish and translucent, occasionally purplish or greenish; white paint chalky, sometimes fugitive. Pigments: Black: combination of lead, copper, and manganese; white: presumably kaolin. Design: Free and bold; geometric, sometimes conventional life forms; jar necks and small part of the upper body covered in white slip, well down on neck interior; white zones painted in black, usually with simple independent elements such as crosses, turkey tracks, dots, stepped lines or paired vertical bars, sometimes three or more. Comparisons: Fourmile Polychrome exterior bowl treatment is the same, but Fourmile Polychrome lacks the large areas of white slip characteristic of Showlow Polychrome. Carlson, Roy (1970) White Mountain Redware: A Pottery Tradition of East Central Arizona and Western New Mexico. Anthropological Papers of the University of Arizona, No. 19. Tucson.